The West is trying to overhype the Kurdish ethnic issue in order to use it as a weapon against Syria, Ghassan Kadi, a Syrian political analyst and expert on Middle Eastern affairs, told Sputnik. Kadi drew attention to the fact that Washington has repeatedly tried to alienate the Syrian Kurds from Damascus and pull them into the American fold. Therefore, the Kurdish question should be tackled in the most serious way. "To begin with, we must acknowledge that Syrian Kurds are Syrians and any attempts to marginalize them or keep them out of the equation is not any less realistic than marginalizing, say, any Syrian religious group or province. Once again, the recent outcries that we have heard and read describing Kurds as fifth columnists and comparing their role to the role that Albanians allegedly played in the former Yugoslavia, is historically incorrect, vexatious, malicious, divisive and highly dangerous. Ironically, such allegations came from non-Syrians who clearly know little or nothing at all about the history and demographics of Syria," Kadi told Sputnik. "Ironically also, and to prove their ignorance, that loud and vocal mob accused me of meddling in Syria's affairs because I am 'Lebanese,' i.e. in their eyes 'non-Syrian.' Little do they seem to know the very recent history of Syria and that Lebanon is part of Syria. If they do not know this fact, in retrospect, I cannot blame them for not knowing who the Kurds are. If some people opt to believe the story of Humpty Dumpty, then this is entirely their prerogative," he remarked. Kadi underscored that the Kurds are not the only non-Arab ethnicity in Syria: there are also the Chaldeans, Assyrians, Aramaics, Armenians and many others. The expert explained that the Kurds have recently become the focus of worldwide attention because they constitute the biggest non-Arab ethnicity and because they have several paramilitary organizations. "But just like the nation of Russia is an amalgam of many ethnicities, so is Syria," the expert highlighted. It is no secret that Washington wants to use the Kurds to create divisions. "However, if Kurds get the security they seek under Syrian sovereignty, it will be much harder for America to lure them to her bosom. By all peaceful means possible and conceivable, Syrian Kurds must be kept under the roof of Damascus, and even though I've said this many times, I was described as one advocating the partition of Syria," Ghassan Kadi emphasized. "The perception of this particular aspect of the Kurdish issue seems to be more prominent in the English-language social media than it is in reality. The pro-Syrian social media need a serious reality check," he added. There is yet another problem which is largely neglected in the media. Various Western "sectarian" groups and "new-age" churches are pushing to get a foothold in Syria amid the ongoing war, Kadi noted. While it does not seemingly spell trouble, there is a hidden agenda behind it. "Firstly, I must put an umbrella label on those Western 'sectarian' groups you mentioned. They are Christian-Zionists; no more, and no less. Their recent and sudden attempts to attack and hide following the efforts that others and I made to expose them speak volumes," Kadi told Sputnik. "Those "missionary evangelists" are trying to ride on the bandwagon of the anti-Daesh sentiment in order to 'prove' that their version of Christianity is better than Islam. I have reiterated several times in the past that only reform within Islam will keep Daesh at bay. Islam is a great religion of peace and wisdom when properly understood. It is only the fundamentalist and perverted interpretations that have given rise to violence in its name," the Syrian expert continued. In his recent article for The Vineyard of the Saker, Ghassan Kadi pointed out that over the last few decades, "new-age" Western missionaries have tried to gain ground in the Levant by recruiting young followers. According to the analyst, these religious conglomerates are upsetting the fragile ethnic and religious balance in the region. The crux of the matter is that some such "sectarian" groups are alienating its raw recruits from their community. Some of them go even so far as to prohibit their members from voting, to donate blood, to join the military, to engage in political or religious activities, and to trust others outside their faith. "As I explained in my most recent article on 'The Saker,' those "evangelists" will find it very hard to lure recruits from the Muslim community. They will therefore focus on the Syrian Orthodox community, as their 'colleagues' have done in the past in nearby Lebanon and several other places," Kadi noted. "If the Syrian Orthodox Church is weakened, Syria will become much more vulnerable to future attempts at Jihadi takeovers. Furthermore, Syrian Orthodoxy is an essential part of Syria's cultural fabric and history. It is currently in grave danger, a stronger danger in my opinion than that of Daesh, because this danger lurks around in darkness, and it works more insidiously in peace time than Daesh does in wartime," the expert explained. "What really irks is that a significant proportion of the support base on which the Western evangelists are trying to build their 'empire' within Syria are well-intentioned Syrians. Gladly however, little by little, they are waking up. If we keep up the momentum, they will wake up sooner," he stressed. "Upholding Syrian Orthodoxy and shielding it from what could otherwise become an avalanche of Western 'evangelists' from many denominations, is perhaps the surest way of keeping that delicate balance as it had been for many centuries. It is a balance that has its weaknesses of course. It is far from perfect, but to upset it by introducing a new 'species,' as it were, is tantamount to playing with fire. With all the problems Syria has now, she doesn't need the introduction of a whole new line of Western Christian-Zionist churches. They can stay in Texas…. or in Virginia," the expert pointed out. He stressed that it is of ultimate importance to shine a spotlight on this largely neglected problem to protect Syrian society, already hit by the war, from further destruction. 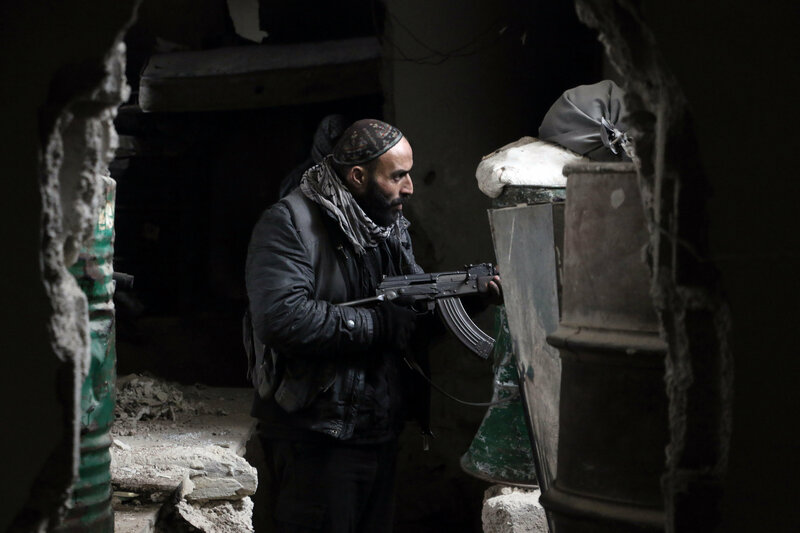 Along with the attempts to break the delicate social fabric in Syria, the West continues to spread its distorted narrative about the political balance of power in the region, misinterpreting the term "opposition" and "moderates." What parties and movements in Syria constitute a real and healthy political opposition? "To answer your question, one has to start with defining the term 'healthy (Syrian) opposition' or 'opposition' in general," Kadi stressed. "If we are talking about a party-based political opposition to single-party rule, the current political plurality of the Syrian Parliament and Cabinet clearly indicate that single-party rule is a thing of the past. More pertinently, parties and organizations that understand this development and work within its framework are, in context of the conflict, not at all considered to be in 'opposition'," he emphasized. At the same time, if we go to the other extreme and adopt the Western definition of the so-called "moderate opposition" we will clearly realize that they are militants not very different at all from Daesh and the al-Nusra Front, Kadi explained. "Thus far, the West has not been able to wield the alleged 'moderate opposition' groups, let alone identify them," the expert pointed out. "In reality therefore, there is no such thing as 'healthy opposition' and/or 'moderate opposition' in Syria, regardless of how one defines them. Those who represent the 'opposition' in Geneva and Vienna are there simply because the West does not allow for such talks to happen without their participation. In reality they are the cronies of the West, Turkey, Saudi Arabia and Qatar. Their only objective is for President Assad to step down. One might ask how this constitutes a reform agenda!" Kadi told Sputnik. The Syrian expert drew attention to the fact that the Syrian ruling party Baath and the Syrian Arab Army have a powerful political ally inside the country: the Syrian Social Nationalist Party (SSNP). "Here I must emphasize that the SSNP has been a powerful and effective ally of the Syrian Army, and the recent attempts of some to put the role of the SSNP under the microscope, accusing it of inciting a rebellion against the Baath Party and/or to seek partition of Syria is unsubstantiated, juvenile, and I would like to say laughable, had it not been quite dangerous," Kadi stressed. "The Syrian government is internationally an ally of Russia, and domestically an ally of the SSNP as well as other domestic and regional players. Anyone who casts any doubts about the solidarity of those alliances is inadvertently undermining the national securities of both Russia and Syria and their combined effort to fight [fundamentalist] terror," the political analyst concluded.